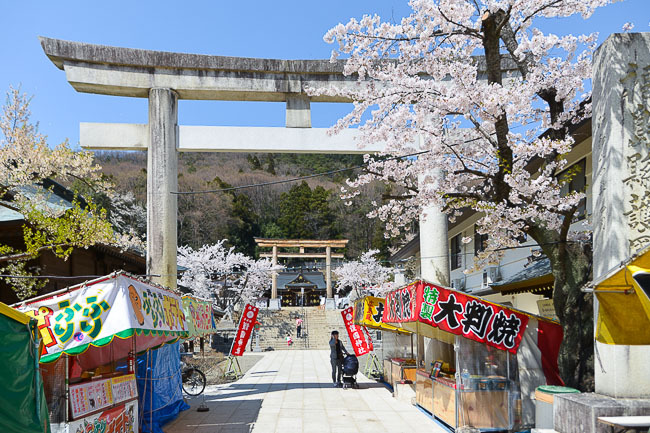 As the season presses on, the cherry blossom front has moved on beyond the popular sightseeing spots of Tokyo and Kyoto and into the northern and more mountainous regions of the country. 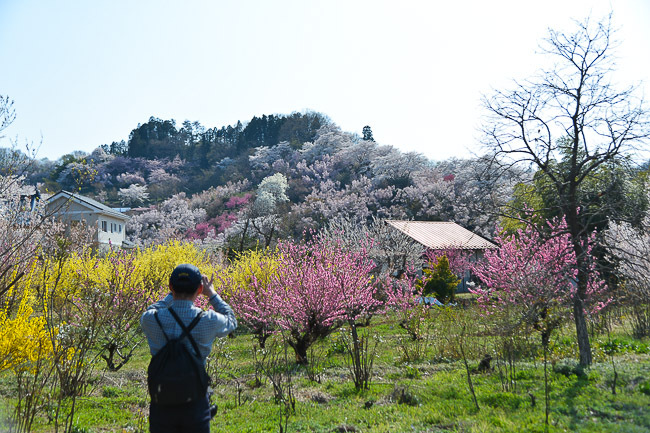 So today I kicked off our reporting from these northern regions with a trip out to Fukushima, where the city's popular cherry blossom spots begin opening about two weeks behind central Tokyo. 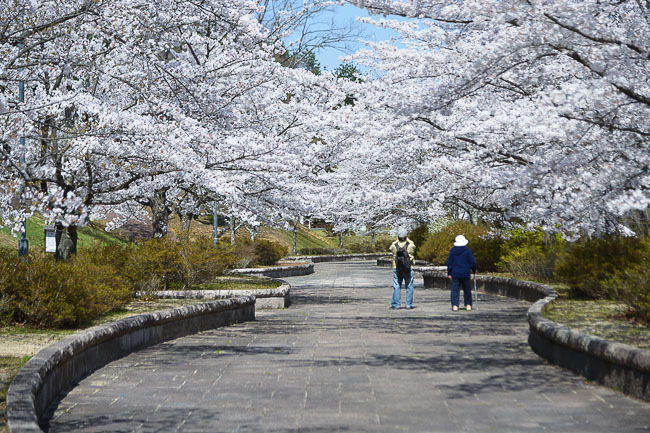 Fukushima is just about 90 minutes from Tokyo by Tohoku Shinkansen, making it an attractive option for those who arrive too late to see the blossoms around the city. 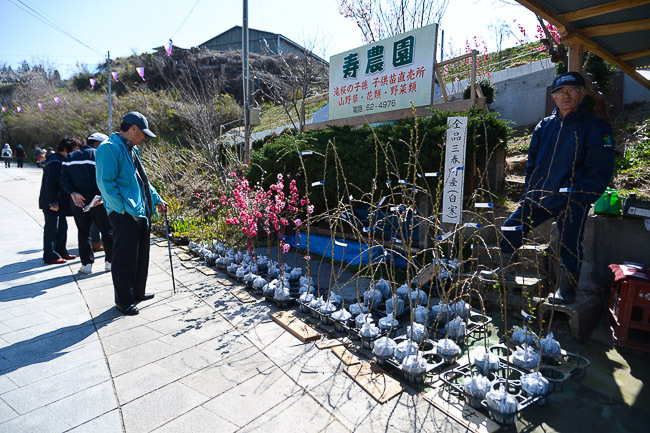 My first stop of the day was to the Miharu Takizakura, which is about an hour outside central Fukushima. 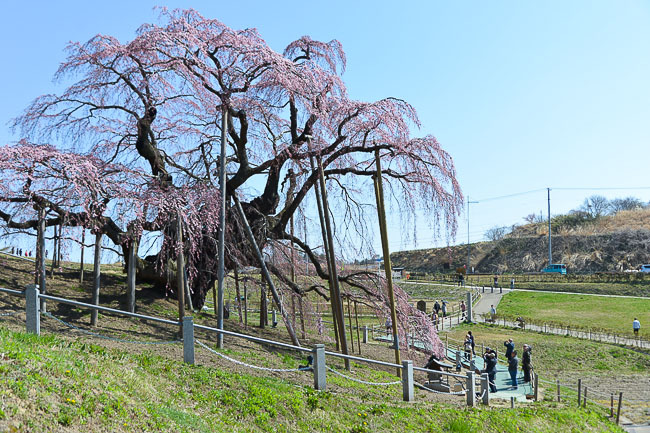 The 1000 year old weeping cherry tree is ranked among Japan's "three greatest cherry trees", and considered by many to be the most beautiful and popular cherry tree in Japan. 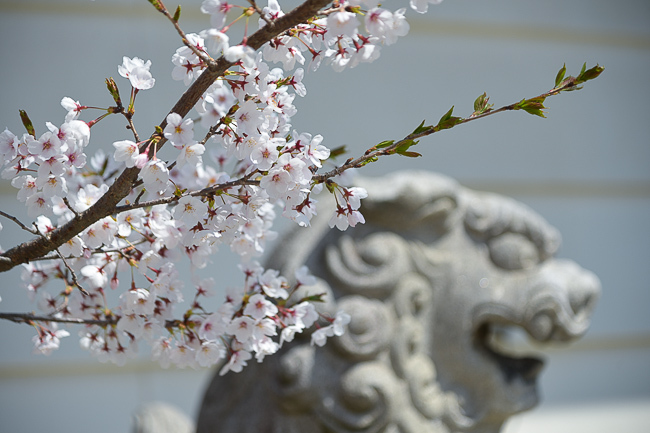 It's long branches hang gracefully, evoking images of cascading waterfalls, hence the name Takizakura, or waterfall cherry tree. The scene may be even better at night when the tree is lit up. This year the illuminations will be from 18:00-21:00 until May 5th. 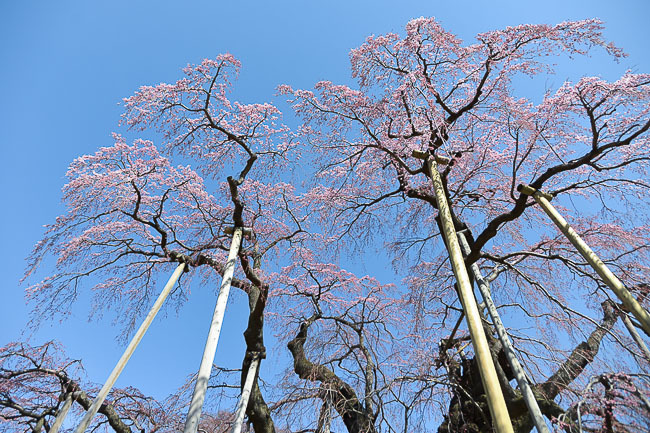 In a typical year, the giant tree's blossoms open about two weeks after those around central Tokyo. This year they opened on April 11 and were still in the early stages when I saw them this morning. 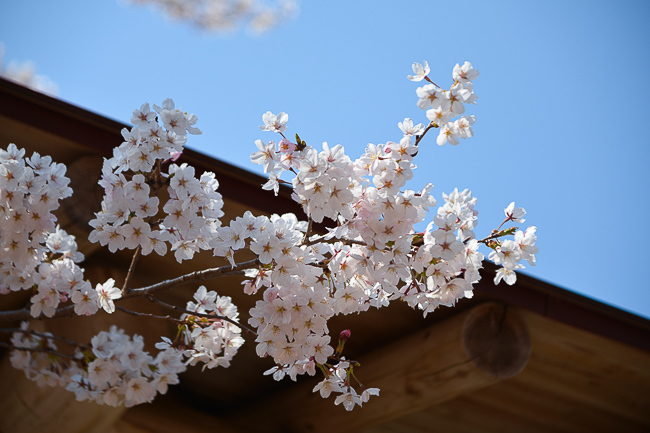 It is going to be several more days at least until the Takizakura reaches full bloom, although the chilly weather on the horizon may delay that even further. That won't stop the crowds though, and although it wasn't too busy this morning (maybe about 200 people), keep in mind that it was 9am on a Tuesday. And the crowds are only going to get worse as the blossoms improve. One of the big bottlenecks is the parking lot, and even though it holds upwards of 1000 cars, during the peak the lines of cars waiting to get in can be measured in hours. 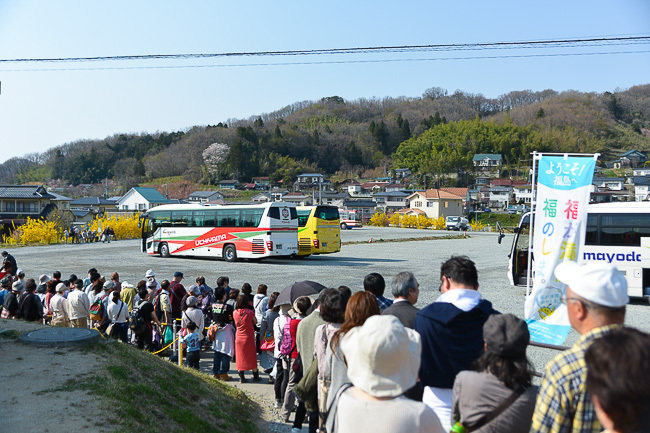 Alternatively, during the season there are JR shuttle buses from JR Miharu Station. These cost 1000 yen for a round trip ticket and operate this year until April 23rd. Outside of that time you can take a taxi for about 2500 yen one way. After checking out the Takizakura, I drove the hour or so to central Fukushima to visit Shinobuyama Park, a large mountain park located not to far north of Fukushima Station. 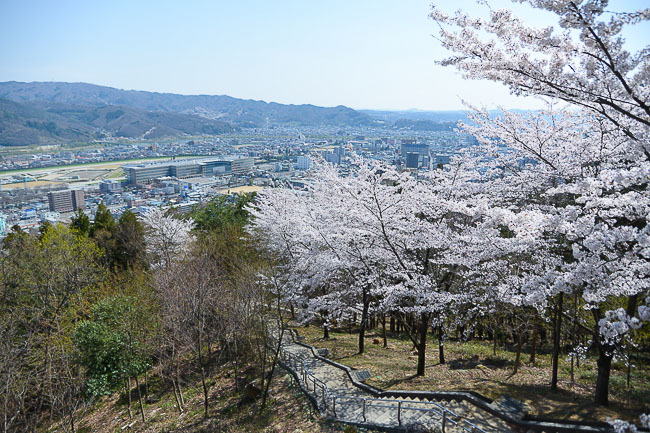 The park is covers the entirety of Mount Shinobu, and consists of several small parks, shrines, and temples on the mountain connected by a giant network of narrow roads, staircases, and hiking trails. 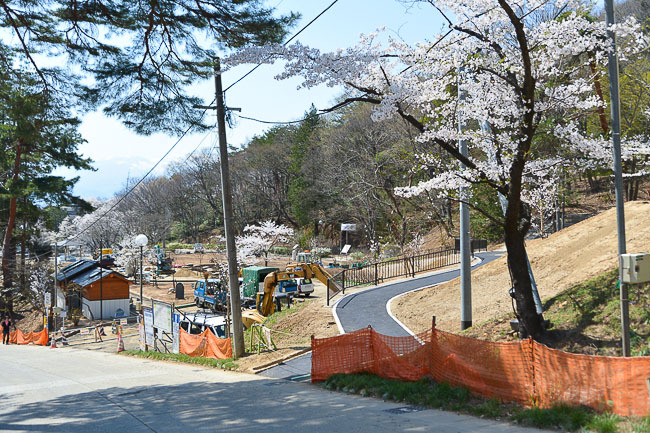 There are about 300 cherry trees scattered around the roads and trails through the park with a few concentrations around Haguro Shrine at the southern entrance to the park and around Observation Deck #2 near the northern peak. 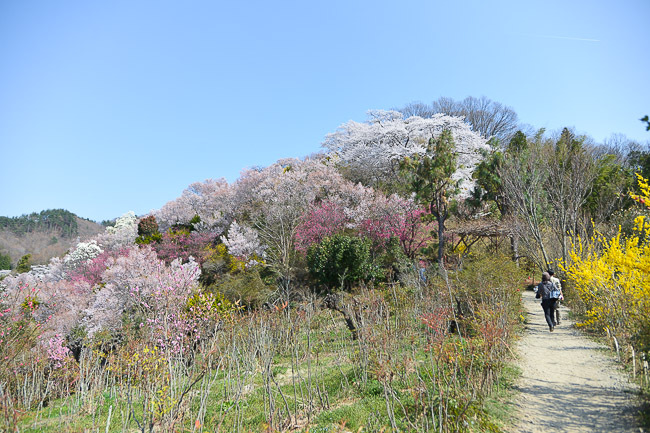 The best area was the Sakura Promenade just above Observation Deck #2, which had a mini sakura tunnel with trees at full bloom. The promenade takes about 30 minutes to walk up to once you get on the mountain. Note that the signage isn't that great, so you may want to alot some extra time just in case. 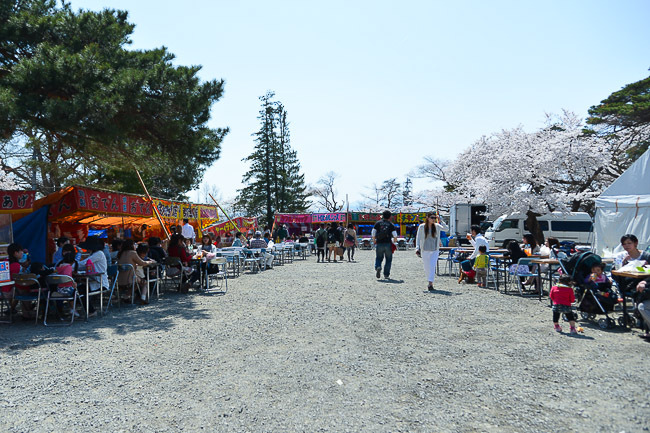 My final stop today was Hanamiyama, an extremely popular hanami spot in southeastern Fukushima City. 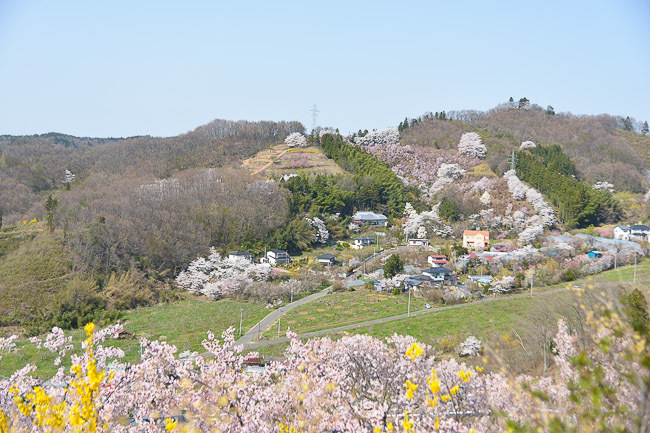 The area consists of several small mountain slopes covered by thousands of cherry trees and other flowering trees and bushes. 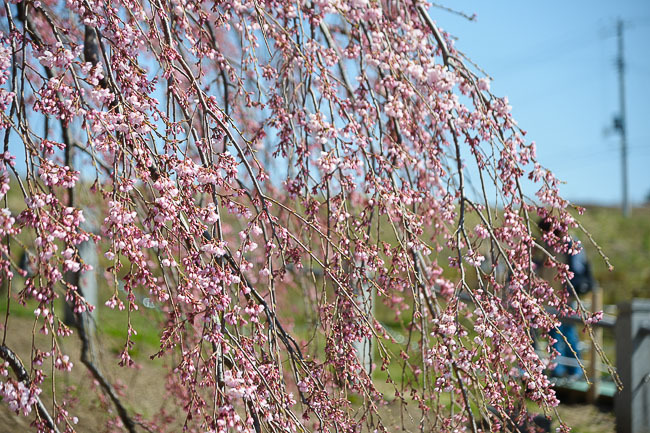 Most of the plants bloom in concert around mid to late April, covering the valley in bright pink, yellow, red, and white blossoms. 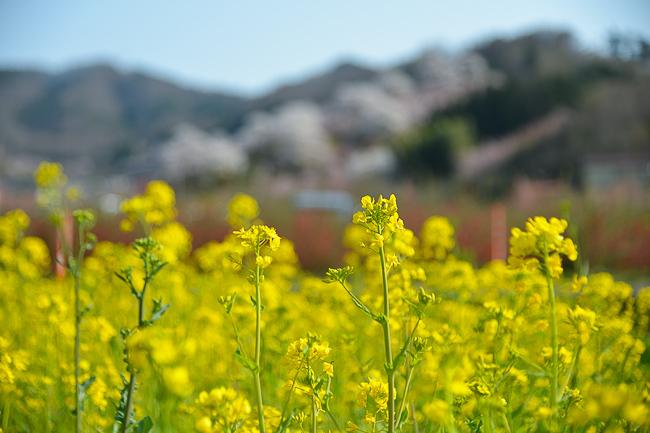 Visitors can walk around enjoying the flowers along the mountain slopes on various walking courses of different length and difficulty. 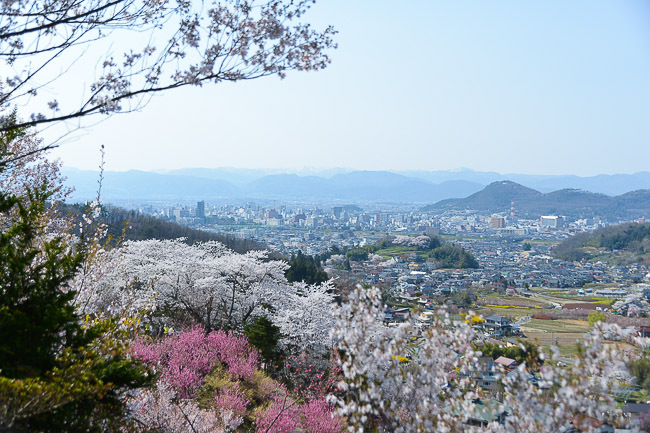 Along the way are viewpoints with views out over Fukushima City and out to Mount Azuma in the distance. 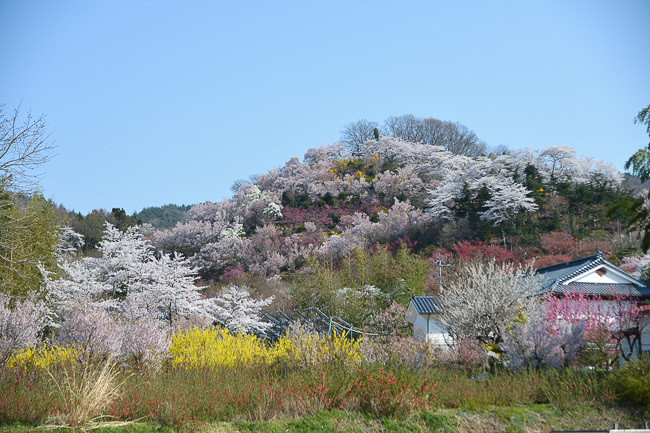 Though far from the only type of cherry tree on the mountains, the Somei Yoshino cherry trees opened about 5 days ago and are already at the peak of full bloom around the mountain slopes. 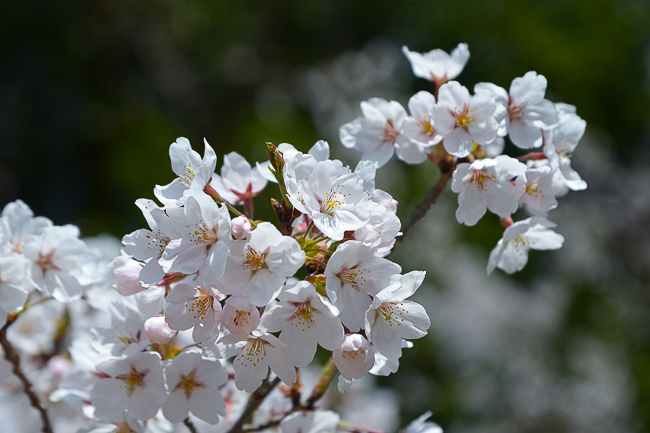 The petals didn't show signs of falling yet, and should remain at their best for a few more days. 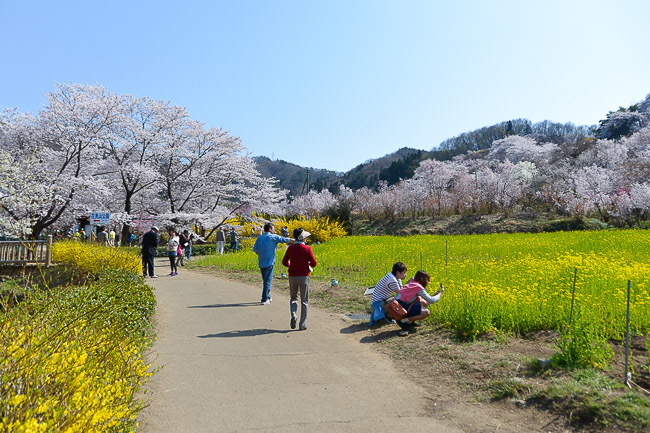 During the peak of the season (now), thousands of visitors come to Hanamiyama to enjoy the flowers. I came by car, but I wouldn't recommend it as the parking lots are about 5km away from the site and you have to take one of the frequent, but crowded shuttle buses. 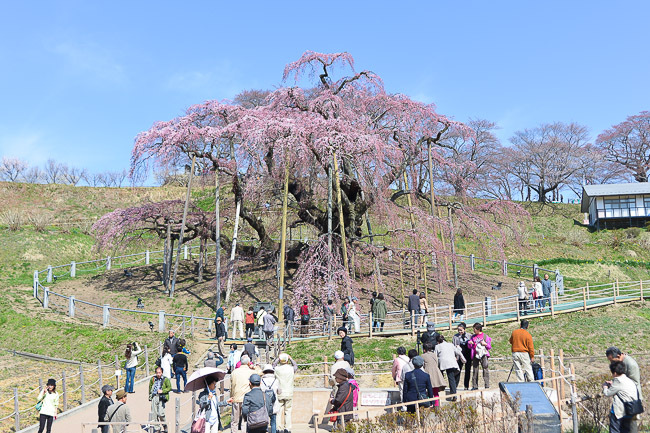 Instead, the area is easily reached during the cherry blossom season in about 15 minutes by a direct shuttle buses from Fukushima Station (250 yen, frequent departures, until April 29). Also consider taking a taxi, especially for the return journey, which cost a flat 1500 yen to the station.